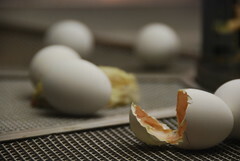 Chicken before egg: How do new fields of practice emerge? How to hatch an industry? Some months ago I was working on market research for a social venture capital fund, a fund that would invest in social purpose businesses. By establishing a social finance mechanism, the hope was to bolster a social entrepreneurship pipeline, one for companies with a hybrid, or blended business model. The challenge: To make a case for eventual deal flow. The problem? A legal gap: In Canada, one cannot incorporate as a hybrid business – so how could we expect deal flow? Much to consider: Can a field develop in the absence of an appropriate context? Must a legal framework be in place to enable the development of a given field? To promote social innovation, should we continue to assist the practitioners or focus on the supportive context they need? Alternatively, a focus on the supportive context may be near impossible in the absence of sufficient examples to make the case for legislative, regulatory or financial changes. Where do we place our scarce time and resources? For any emerging field, if sustainability is of interest, it would seem that investment opportunities and vehicles of investment must develop along side. In this way, both social entrepreneurship and social finance are gaining momentum at virtually the same time. However, still in question is what’s commonly (or colloquially) referred to as “the stick factor.” Social entrepreneurship as it pertains to business model innovation and social system transformation should not be seen as a trend. So, how to make it last? Economics, considered a “network grade” infrastructure, or necessary foundation for business, is also a prerequisite for social innovation and entrepreneurship. In this way, the legal system is just as influential as the financial system. But under the Corporations Act, a Canadian corporation is a non-profit or a for-profit — a dualistic framework enacted almost a century ago. The UK has a legal distinction called a community interest corporation, or CIC. The United States has adopted the L3C in some areas, a distinction that will most likely proliferate countrywide, given Obama’s Office of Social Innovation. There is also the BCorp status, a recent Canadian adoption from the States, which is more of a branding exercise than anything else, however not to be dismissed. Walking into an investors’ pitch is daunting under the best of circumstances. Can you imagine having to spend those first precious minutes having to describe your business model to unsuspecting angels? Confusion is not the best starting point. Having a distinguishable legal entity for social ventures is an important piece to the puzzle, not only to promote a general understanding of their blended value, but to also lay a crucial legislative framework. If a framework were in place, this would necessarily legitimize the emergence of the social innovation space. Social entrepreneurs – from affordable housing to green business – would have this hybrid space as a rightful option, not just an intellectual construct. Social entrepreneurship and innovation can be compared to any other emerging field. There may be a certain number of chicken-before-egg scenarios before it’s is considered mainstream — think cleantech or information communication technologies. SiG is actively working on both social finance and the legislative framework while helping social entrepreneurs by giving them access to resources and mentorship. It is our hope that, with partners, we create the supportive environment and practical knowledge for social entrepreneurship and innovation to flourish as established fields in this country. Are you a social entrepreneur? Sign up on our Social Venture Registry here!